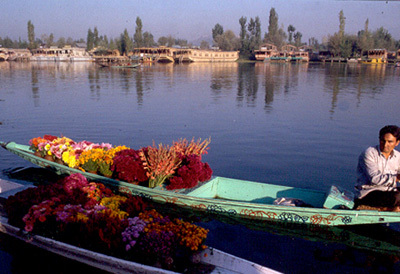 Gulmarg, Gulmarg Kashmir,Gulmarg Tour, Gulmarg Trekking,Gulmarg India,. 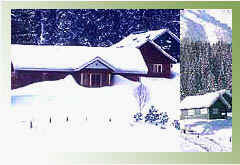 Gulmarg looks li ke a fantasy set in a film and not surprisingly have been the venue of several films. The valley of Gulmarg, a large meadow about 3-sq-kms in area, stands at 2,730 metres, 56-km south west of Srinagar . The name means 'Meadow Of Flowers' and in the spring it's just that, a rolling meadow dotted with countless colourful Bluebells, Daisies, Forget Me Not's and Buttercups. The valley itself is about 3-km long and up to a km wide. In wint er, Gulmarg acquires a new persona - that of the country's premier skiing resorts. Skiing, to many who watch it on TV, seems like a very elitist sport, requiring a high level of training and expensive equipment. They are surprised, when they visit Gulmarg for a day's expedition to "see the snow", that others with the same level of physical fitness and training are skiing down slopes. 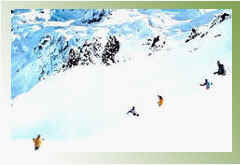 Gulmarg is the ultimate beginner's skiing resort. One doesn't requite a heavy woolen wardrobe - slacks or a Salwar Kameez will do fine. 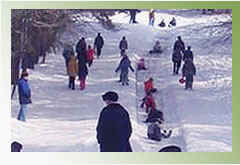 In Gulmarg one will also be able to drift to one of the many Ski shops and hire skis, sticks and goggles. Just find yourself a ski instructor and set off down a slope.